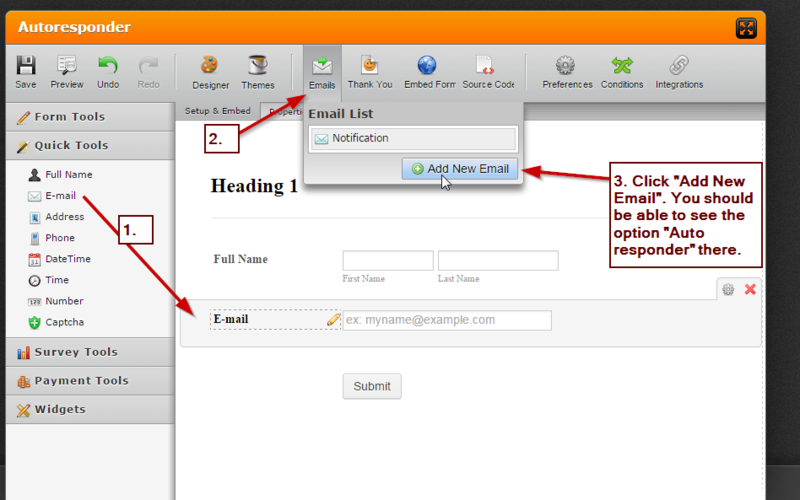 The user should fill his name and email to send the form. I wanna this email as Sender email for each customer. I believe what you are setting up is an autoresponder, please check this guide we have on how to set it up: How To Create A From Autoresponder. For a quick guide you can check the screenshot below. I hope it helps. Let us know if this is what you're looking for. The form the customer fill is sent to a Zendesk helpdesk system. I'm using 2 emails address to receive the data: my own email and the helpdesk email. The Helpdesk receives the message as JotForm (email) but I wanna the helpdesk receives as the email from each person who fills the form. This is what I ask. Is it possible? It seems that is not possible, if I'm not mistaken, you'll need to set the "Sender Email" under notifications to the user's email. Is that correct? If that is the case, it is not possible, we'll need to send the submissions to the email of the owner of the form or using the JotForm default email. But, I see that we Zapier has an integration between JotForm and Zendesk. I'm not familiar much with Zendesk but this might help you on creating automatic tickets when a form is submitted, at least that's how I understand the integration. Please check if this is what you are looking for.